BUMPER BAND ® guards are made from a flexible material designed to provide additional moisture protection and protect against accidents. Available in 1 /8 and 3 /64 DIN sizes, BUMPER BAND ® guards are compatible with DP40 Series and DP24, DP25, DP26, DP119 and DP116 Series meters. Guards are available in gray, yellow, black, blue, green, red, orange, purple and white. Splash-proof covers provide additional protection for instruments. Following NEMA-4/IP65 guidelines for windblown dust and rain, splashing water and hose-directed water, SPC covers form a protective seal around the instrument bezel. 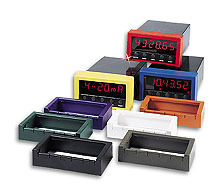 Available in 1 /4 , 1 /8 , 1 /16 and 3 /64 DIN sizes for compatibility with most panel meters. The DP41-TBS allows the DP41 to be used as a benchtop meter at fixed angles, or it can act as a carrying handle to facilitate moving the meter.